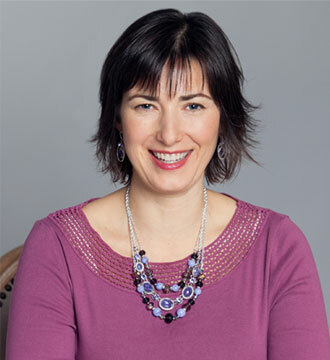 An area of emphasis on the GAPS Diet™ that is often overlooked is detoxifying your household cleaning products and switching to non toxic home cleaning. Most household cleaners from the store contain toxic ingredients, even when they have terms such as “natural” and “environmentally friendly” on their label. These terms are strictly for marketing since there’s no regulation of their use. A quick way to find safer alternatives is to check out the Environmental Working Group’s Guide to Healthy Cleaning and punch in your favorite product to see how it’s rated. Or you can find something new by choosing from the products with the safest ratings. I keep my non toxic home cleaning very simple and I’d like to share with you the handful of products that I use most. This cleaner is made by Young Living Essential Oils. 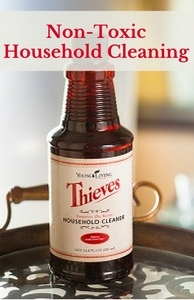 It contains their Thieves essential oil blend along with lemon essential oil and a couple other non-toxic ingredients for a super-concentrated household cleaner. When people come over after I’ve cleaned they remark on how wonderful it smells and how it doesn’t have that “chemical clean” scent. It seems a little pricey at $22 a bottle, but when you realize how concentrated it is, it’s well worth it. One bottle makes 29 30-ounces spray bottles when it’s mixed with water at the ratio for general cleaning. That’s $1.32 a bottle at the wholesale member price! I keep a couple different spray bottles around the house with different concentrations for different things. For general household cleaning I do one part Thieves Household Cleaner to 30 parts water. For glass cleaning I do one part Thieves Household Cleaner to 50 parts water. For tougher greasy jobs I use a cap of full strength Thieves Household Cleaner on a sponge. Baking soda is my all-purpose scouring powder. I often combine a sprinkle of this with my Thieves Household Cleaner to scrub things like soap scum in the shower, or the built up food and grease in the kitchen sink. Baking soda is indispensable and incredibly economical. I keep a spray bottle with 50/50 white vinegar and water on the kitchen counter. I spray down the butcher block and cutting boards with this to kill germs because it doesn’t leave a lingering scent or taste. I also spray this in the compost bucket after it’s been washed. The threat of being sprayed with this keeps our kitten off the kitchen counters (she thought being sprayed with plain water was fun). I buy a large pack of the Pop-up Sponges from Trader Joe’s and keep them all around the house. They last a long time and don’t add additional plastic waste to the world. I use these for most of my cleaning with the Thieves Household Cleaner or baking soda. A stiff bristled scrub brush is my go to grout cleaner. It gets into all the little nooks and crannies between the tiles, so it doesn’t take so much elbow grease to get it clean. I use this with a paste of the Thieves Household Cleaner spray and baking soda. I bought a set of these microfiber cleaning cloths 15 years ago and they’ve held up great! I use microfiber cleaning cloths for dusting, surface cleaning, and glass cleaning. For mirrors and windows I dampen one and wipe it down, then use a dry one to buff that off and get things shining. I use these with the Thieves Household Cleaner spray for things like wiping down door handles, light switches, and the banister on the stairs. This is by no means the only or best way to clean your house in a non-toxic manner. I just want to share what I use, and how simple the products and methods can be. 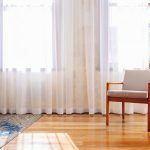 When you get a good all-purpose cleaner like the Thieves Household Cleaner, you don’t need a different product for every job or room in your house. This saves both space and time. I don’t have to cart things all over the place. I just keep a bottle, a sponge, and a rag on both floors my home. 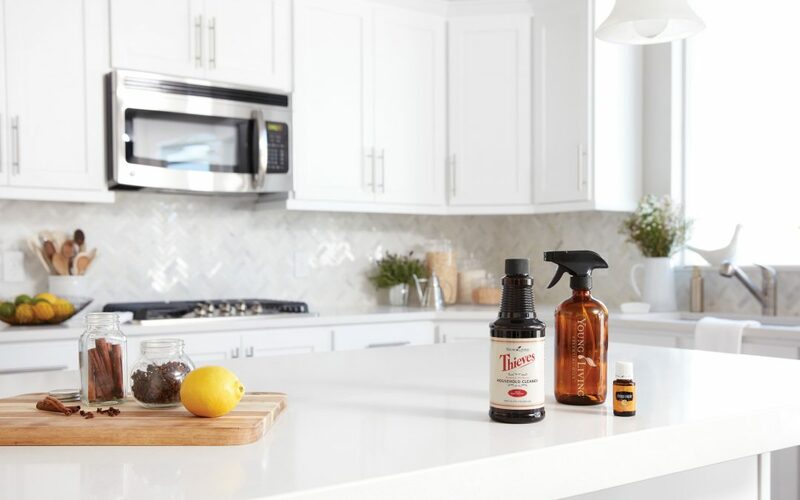 If you’re interested in trying the Thieves Household Cleaner from Young Living, click here to learn more about becoming a wholesale member through Body Wisdom Nutrition and choose the Thieves Premium Starter Kit or Contact Me for personal help in placing your order. What would be your solution for someone who uses designer colognes? I would suggest switching to essential oils, searching on the internet or in books for recipes for “colognes” that have similar notes.